The dual-band system features AC 2x2 802.11ac Wave 2 with MU-MIMO radio configuration, boasting a combined speed of up to 1,300 Mbps. Setup and management is performed through the mobile app, and if you already have the tri-band Velop system, you can add dual-band nodes to extend coverage. If you have an Echo or other Alexa-equipped device, you can also ask Velop to enable or disable the guest network. I'm in the process of reviewing the new Velop system, and so far I'm liking it. The 1-pack (AC1300) is $129.99, the 2-pack (AC2600) is $199.99, and the 3-pack (AC3900) is $299.99. You can pre-order it starting today, and it will go on sale at all major retailers on May 15. LOS ANGELES, May 1, 2018 /PRNewswire/ -- Linksys®, celebrating thirty years of networking and WiFi innovation for the home and business this year, today announced the availability of its latest addition to the Linksys family of Velop™ Whole Home WiFi Mesh Systems, the new Velop Dual-Band Mesh WiFi System. The new Velop Dual-Band Series is a smaller and more affordable WiFi System that is designed and built as the world's first mass-market flexible WiFi System. It also provides all the same award-winning and powerful software features found in the Velop Tri-Band offerings including Intelligent Mesh™, advanced parental controls, website blocking, Amazon Alexa compatibility, as well as ease of use and set up with the Linksys App but in a smaller form factor with Dual-Band technology at a more affordable price. "Velop is now the most flexible whole home mesh WiFi system on the market," said Justin Doucette, senior director of product management at Linksys. "We have a Velop offering that fits any home or small business environment as well as options for different broadband service packages to deliver the best WiFi experience for all the devices on the network. Our new Velop Dual-Band provides the price for performance that customers are looking for plus all the intelligent software and security features that continue to be updated for real time access to the latest enhancements." 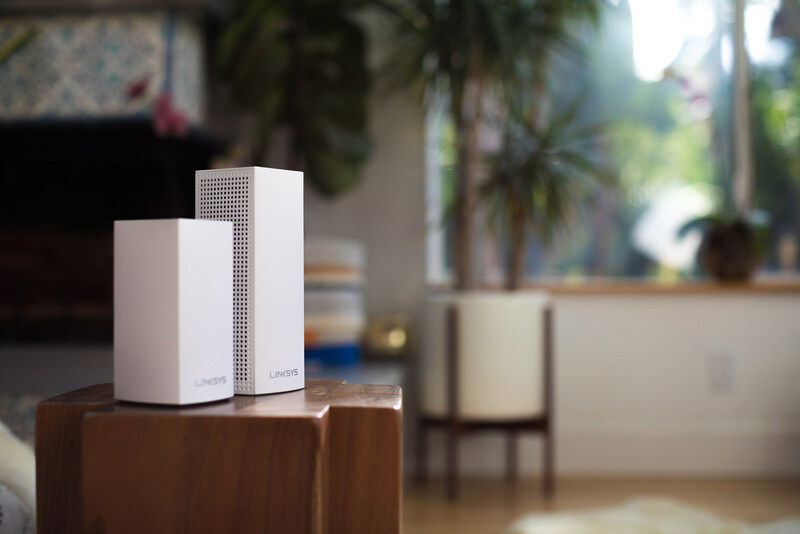 Linksys is expanding its Velop family to include a Dual-Band modular mesh WiFi system, (available in 1-pack, 2-pack and 3-pack options) that can be installed in various mesh configurations to support any type of home, floorplan or WiFi footprint. Velop is compatible with any ISP modem or gateway. Both Dual-Band and Tri-Band nodes are 100% interoperable and interchangeable and allow for easy upgradability based on a customers' need. Velop Dual-Band nodes are designed for performance as well as elegance; they stand about two inches shorter than the Velop Tri-Band solution and small enough to be placed anywhere with a clean and attractive look that appeals to everyone - which is unique to the mesh category of solutions for the home. Also coming soon (planned for June) is a Velop Wall Mount to put Velop in high locations on the wall or remove from shelves for a clutter-free environment. The nodes work together as a WiFi system to provide reliable wireless connectivity throughout the home. Each Velop "node" is a powerful Dual-Band AC1300 device that can act as a parent node or client node to deliver WiFi all around the home while providing future proof technology customers need as they bring new and more devices into the home. Individual nodes may be connected wirelessly or by Ethernet for the fastest, most reliable connection. This is an ultra-simple and powerful system that uses only one WiFi network name and password to give users seamless and highly secure WiFi. Powerful Dual-Band Technology–Each Velop node is a Dual-Band AC 2x2 802.11ac Wave 2 with MU-MIMO radio configuration with combined speed up to 1300 Mbps*. Intelligent Mesh Technology – Intelligent Mesh™ Technology is aimed at simplifying WiFi networking and optimizes end-to-end performance. The Velop system adapts to a user's WiFi needs. It self-heals and optimizes to consistently deliver fast, flawless WiFi everywhere in home. The Linksys Velop Dual-Band Whole Home Mesh WiFi System (available in 1-pack, 2-pack and 3-pack) is available for Pre-Order starting today thru Amazon.com and BestBuy.com and will be available in all major retail and online stores including Best Buy, Amazon, B&H, Fry's, Newegg, Microcenter, Staples, Walmart and Linksys.com starting May 15, 2018.